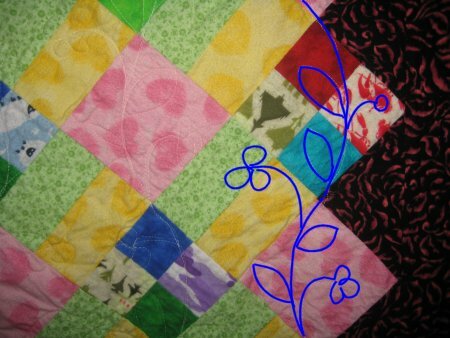 I saw this layout online someplace and replicated it in Electric Quilt. I just liked the easiness and simplicity of the 4-patches, rail fence & plain blocks set on-point. I had a BUNCH of velvety flannel remnants and decided this would be a perfect project to use them. Unfortunately, somewhere between the planning and the execution, things went slightly awry. When I pulled all the flannel remnants, I didn't have any neutral for the plain blocks, but did have a cute pink hearts tone-on-tone, which I used instead. It wasn't until I actually sewed all the rows together that I realized the pink was truly too strong of a color and instead of seeing the 4-patch/rail fence as a lattice, all you see is the pink plain blocks! You'll see in the EQ rendition that with the neutral plain blocks, the lattice is much more evident. I wasn't going to rip it all apart to resew it, especially since I didn't HAVE a neutral flannel and the reason for this quilt was to use my existing remnants. So, the pink stayed. 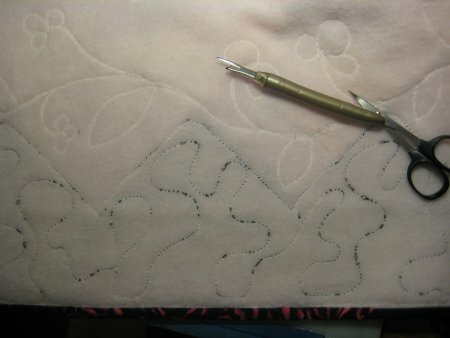 The backing is a pastel pink fleece; no batting is used, as the fleece plus flannel is warm enough. 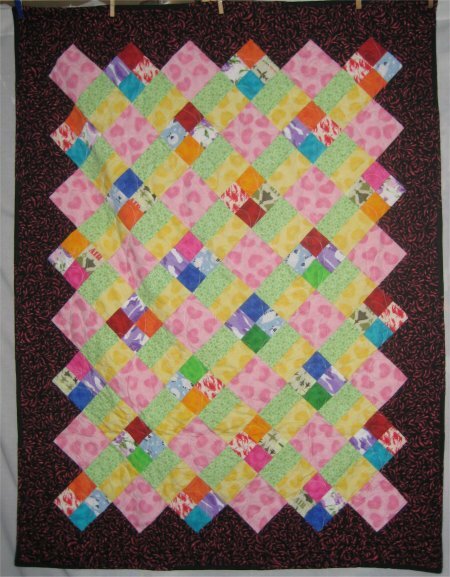 This is my third quilt to be quilted on Lizzie. I did curving vines with leaves and flower stalks on alternate columns. I used a ruler to do a straight line edge stitch along the setting triangles and a meander between the edge stitching and the binding. It wasn't until I unloaded the quilt from Lizzie and had turned it over that I saw that the entire top border area had horrid, horrid tension. I'm not sure exactly what happened but the tension was bad enough that the backside had huge top thread loops in the meander. Since the top thread was black and the backing was pale pink, it was REALLY obvious. Although I tried to tell myself that it really didn't matter, it did bother me. Eventually, after the binding was done, I removed the bad meandering ... it was easy enough since there was literally NO bobbin tension, I was able to simply pull the bobbin thread from the loops. The top thread then just zip-zip-zip pulled out. There was no frog-stitching per se. I redid the meander on my home machine. (Interesting side note: because the throat area of my home machine is (obviously) smaller than Lizzie, the meander done on the home machine is smaller in scale because I don't have as much room to see what's going on ahead of time.). Although I don't quite remember checking & correcting the problem, I obviously did so, as it was only the top border area that was affected. The rest of the quilting didn't have the same tension issues. When it came time to make the binding, I discovered that I didn't have quite enough of the black/pink border fabric to go around. Not to be thwarted by a mere lack of fabric, I created a strip set of the black/pink flannel and a black brushed broadcloth. The bias binding was created from this strip set, resulting in a subtle striped binding. This isn't exactly what I had in mind, but it works ... and I didn't have to buy new fabric to do it. 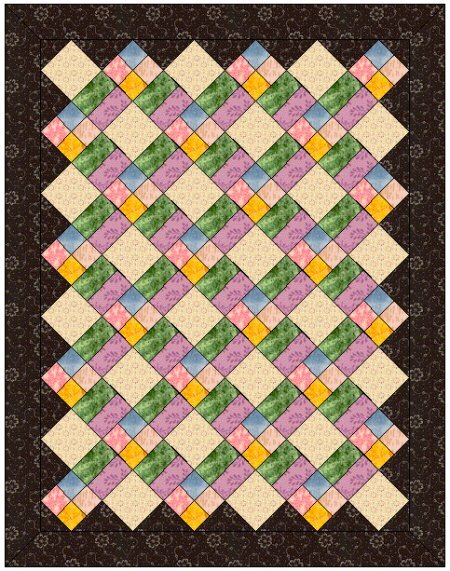 This quilt, 4-patch & Rail Fence, is one of the quilts that I sent to help with the Taylor Bridge fire effort.